Water in the Community › What’s the Solution? All of the problems highlighted stem from mismanagement of water as a resource. We are not using water to our benefit, and with it comes neglect and a wealth of wasted resources. Our vision for water is where communities are empowered and engaged in managing their local water environment, and reap the rewards. Flooding and drought, pollution and resources infrastructure should all be addressed together as part of a low-cost, long-term, multi-benefit, holistic catchment scale management plan. Critical risk – mismanagement of water can cause death, illness, loss of property and many other serious consequences. Our approach identifies and resolves these risks at low cost. Low Cost – affordable for communities, self-financing, favour soft-engineered solutions. Long-term – sustainable management requires fixing the cause of the problem, not just the effects, for long term cost effective solutions. Naturalistic – these are multi-benefit solutions which improve biodiversity and the aesthetics of the landscape, and enable communities to enjoy and benefit from a sustainable use of the water resources. 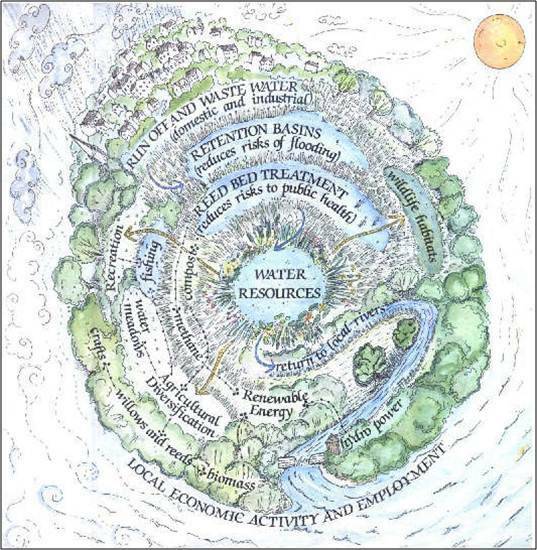 Holistic – an all-encompassing view includes all aspects of the water environment in your community. Catchment-scale – water should be managed throughout the entire hydrological water-shed, because management of water in one area will impact water in the rest of the catchment.